This is getting awkward. 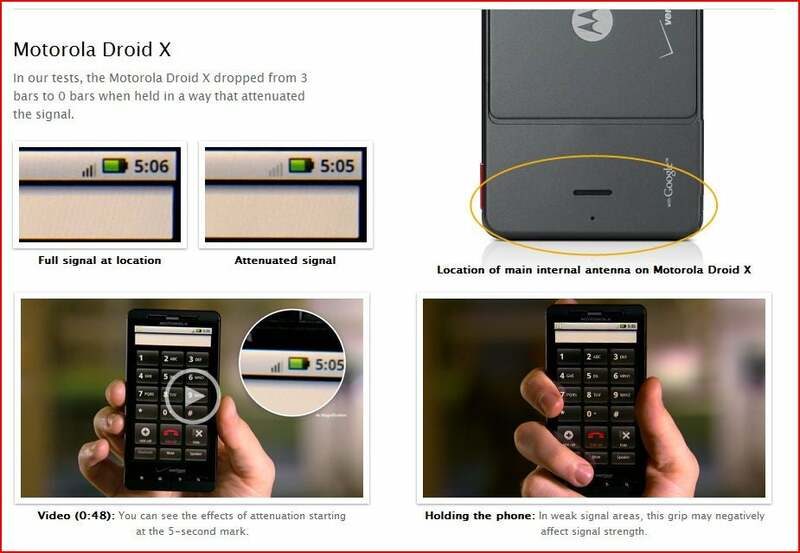 Apple on Friday targeted another smartphone on its antenna performance page, the Droid X. The addition of the Droid X rounds out Apple's page, which launched after last week's press conference in which Apple acknowledged the iPhone 4 did have antenna issues, but emphasized they aren't unique to its phone and at then offered free bumpers for everyone. The page now features allegedly antenna-impaired phones from HTC, RIM, Samsung, Nokia -- added earlier this week -- Apple, and now, Motorola. To be fair, Apple's video shows the Droid X being held in a not-so-awkward fashion, unlike the demonstration of the Droid Eris death-grip, which Lex Friedman at MacWorld says won't affect the signal too much "unless you intentionally--and, in my view, awkwardly--reach a finger up there . . ."
Some folks seem to disagree that attenuation is an issue with the Droid X. Engadget reports, "unlike Apple's other videos, we can't seem to recreate this one as easily with our Droid Xs." Preston Gralla of Computerworld didn't seem to have issues, either. On July 15 he wrote, "When I want to make a phone call with the Droid X. Then I make the call. No duct tape, new case, or bumpers required. You can't say the same about the iPhone 4." Could it be that Apple is feeling the pressure of Verizon's latest flagship Android device? After all, the phone did poke fun at the iPhone 4's antenna issue and some are saying Droid X trumps Apple's latest offering.